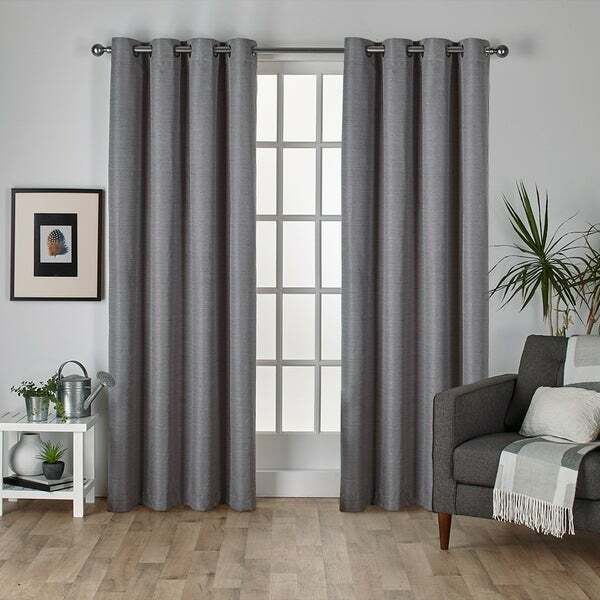 Add a finishing touch to any room with these casual curtains from Porch & Den. Made from silk, faux silk, and polyester, the curtains have a raw silk look and subtle sheen perfect for contemporary homes. The panels block light, keeping sun glare off of your TV, and insulate your home from hot and cold temperatures. Dimensions 108.0 In. X 54.0 In. X 0.1 In. These panels are beautiful! I read the reviews before I bought them and most people talked about how wrinkled they are when they arrive. I ordered anyway and I'm glad I did. Yes they were very wrinkled but I used my iron on the silk setting( with steam) and ironed them with the grain of the silk (this is important,as the wrinkles disappeared once I ironed them with the grain instead of back and forth). They look terrific in my dining room and the color I ordered(grey) is perfect. I highly recommend these...ironing only took a short amount of time. The price is amazing for the quality of these. The black out feature is very good also,although that was not my main reason for purchasing these curtains. 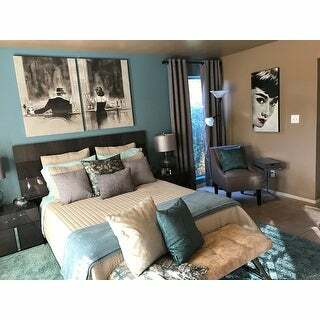 I've been looking for room darkening curtain panels for our living room and bedrooms. I love the look, feel and color of these. The room darkening aspect is ideal! The down side is the width /length stated versus what it actually is. They state each panel is 54 inches wide and 84 inches in length. They are exactly 53 inches wide and 83 inches long. I don't know if this is a strange industry standard or if this is why they are on Overstock.com. I truly needed that stated inch. They are behind a couch so the length isn't an issue but beware that the size is definitely off by a good inch in depth and width! First, a couple of inaccuracies in the description. These are not raw silk, they are polyester. It's really surprising they can get by with listing them as "raw silk" in the title when they are not. I knew from reading the description they were polyester, but don't want others to be mislead. Second, the mallard blue were pictured with black grommets, however they arrived with brushed nickel grommets. I went back and read the description, and it does list brushed nickel. This time I was tricked by the photo. Apparently you must be VERY careful with this company to read every detail so you know precisely what you are getting. 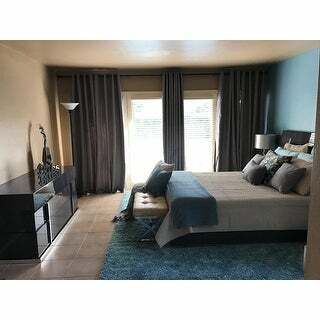 I ordered the mallard blue curtains, 108". They were ever so slightly more teal than I was expecting from the photo, but it's a lovely color. Overall they are a good weight, not heavy or bulky yet they block almost all light coming in from my covered porch. There were a couple of spots where the seam wasn't right and a little of the lining was caught around the holes, but nothing that showed or we had to repair. They were quite wrinkled on arrival as many people have stated, and the directions were for no or very little ironing. This is frustrating, if you're going to get an item incredibly wrinkled without good instructions on how to make it usable! We just inched the iron up bit by bit, and eventually were ironing them almost on the cotton setting with plenty of steam. Didn't seem to hurt them, and they came out nice and smooth. They were easy to train into pleats with some clothespins at the bottom for two days. The fabric is just what I wanted, not too shiny and not too drab. It seems a quality tight weave with nice texture and dimension up close. I don't really know if it resembles raw silk, I think that smells awful and try to stay far from it! With the thickness of these, I guess I wouldn't expect that comparison. They just look and feel like polyester to me. I haven't purchased really high-end drapes so I can't say how these compare, only that we're happy with the purchase and they look nice. But read the details CAREFULLY or you too may have to color all the grommets with a Sharpie. Love here curtains. I have had them up now for a week and they do keep the heat out and the room dark. They come with tight folds so be prepared to iron or steam out. The inside grommet hole measures 1 inch and 3/8 . Normal size for curtain rods. These are well made. Definitely recommend. I bought 4 pairs .totally worth the money. These raw silk curtains looked great online, but are nothing like described when you get them home. They are very heavy, wrinkled, and the length was several inches too short.. The curtains I took down were the same length, yet when I hung these raw silk curtains, they fell way too short. Sent back immediately. 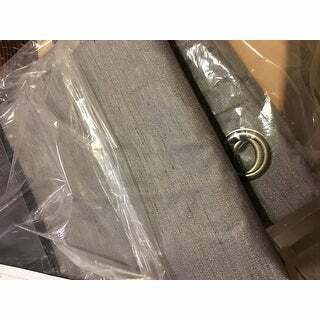 I purchased the drapes in the gray and white color. The synthetic fiber is easy to keep clean and looks like real raw silk. The gray colored drapes are room darkening and are nice to have for a window that faces to the sun. The off white drapes are a milky colored white and are absolutely beautiful. These curtains are great! I could tell a noticeable warmth in the cold room as soon as I had had them up for 15 minutes. They are wider than some others I have ordered at Overstock, so look nicer on the rod. The fabric is a lovely imitation of silk; I ordered the mallard blue and it is basically a navy. The faux silk is a great fabric; thermal and light blocking properties are great. Would order again. I recently bought a house and the living room had old curtains that needed to be replaced. There is a sliding glass door that goes outside to a patio, as well as another window that faces the backyard. Needless to say, I wanted curtains that blocked out all of the bright, Florida sun. I looked at many local stores and websites trying to find the right ones. I wanted lined, thermal curtains, with bronze grommets. After looking at the previous reviews for these, I ordered 3 total pairs (2 panels in each). I used 4 panels for the patio doors and 2 panels for the other window, which is perfect. They were very creased and wrinkled from being folded in the packaging, so I did have to use the steam function on my iron to get the wrinkles out. I did so while they were hanging, and it worked perfectly. All in all, I am very happy with these. I like how they are not a flat color either, they have some texture to them. I bought the beige/taupe color, which is definitely more beige, and they seem to block out the majority of the sunlight ( the back lining is white). I'm hoping that going into the hot summers here in FL, they help keep the heat out and keep the living room cooler. The raw silk looks beautiful. The curtains are thick and heavy. Perfect for blocking out the sunlight without having to put up blinds. I bought the off white and I like the color, not yellowish. 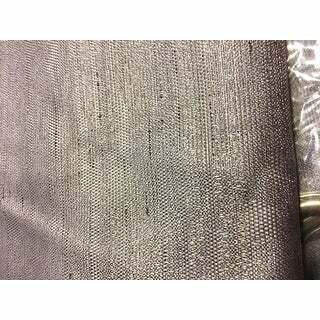 Fabric has a nice pearly finish. I put each in the dryer with some damp washcloths to take the folds out, which was moderately successful. They are NOT very light-blocking. One of them has a flaw in the backing, which you can see when the light comes through, but it's not too bothersome. These draperies are gorgeous and room darkening as well. However, due to the nature of the material, they do have a lot of wrinkles from being packaged. I was in a hurry to get them hung before having guests over, so I wasn't able to press or steam them. Most did fall out eventually, but some deeper ones are still present. I am extremely happy with them though. They are heavy and beautiful! I purchased the Black Pearl but they are a deep grey, which is what I wanted. These are not at all as described or as the picture looks. I was longing for a dark grey and they're more of a light to medium with flecks of black. This picture shows them at night so they're a little lighter than pictured. Nice look for a more manly look though. Do not recommend CURTAINS! Bad quality control. 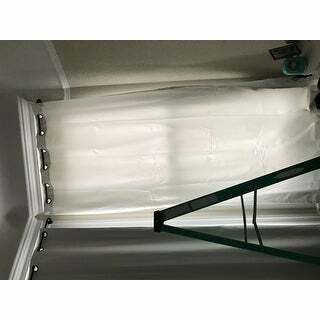 Ordered the off white thermal curtain (set of 2). Both arrived filthy, we think probably a return and accidentally sent to us. Asked for replacement and to check before shipping. Set arrived fine. We ordered a second set to match and requested that they check before shipping. Was told absolutely NO, they could and would not do it. Shipment arrived, one out of 2 panels arrived with dirty mark. Called customer service and asked if they could just ship one replacement and check it really well first. NOPE, had to send 2 panels. Not happy at this point but we really like the curtains. Again, they send a replacement and one of the 2 panels had a black/dirty mark. So out of last 2 orders, one clean panel each. Good thing we held off on shipping back the 3rd order. Such a hassle to have to contact customer service, and drive to ***, not once but twice! DON'T RECOMMEND!!! I ordered three sets of taupe & three sets of black pearl. I had to return the first set as the curtain rods were hung higher than I had anticipated. The second set of six I ordered in 96". One set of the taupe curtains were actually 96" long, the other five sets of curtains are all maybe 92". The color of the curtains are all matte, and the two shorter sets of the taupe curtains are a different color than the 96" curtains. Very disappointed in how they all turned out. I have these panels in my bedroom. Excellent for reducing light and the quality was fine. The length was a bit off - seemed to be a 2inch short. The curtains are definitely not blackout. We bought the ivory, and it was completely sheer! I am so disappointed. These Drapes are pretty nice. They have a nice texture and the color (dark grey) is perfect. The packaging is good but be very careful unpacking. They are sort of tied onto the hanger with plastic tags and with pull the fabric easily and leave small holes if you’re not careful. I got the 96” and the creases aren’t hanging out. I’m hoping by steaming them they will lay a little better. I’m still keeping them. We bought these to use in conjunction with sheers, and they really do the trick when we need to darken the room for a video presentation. They also keep the cold out nicely in the winter months. Exceptional quality! Color is perfect; blocks the light just as stated. Curtains are great quality, thick and blocks out most of the light. Size and color were as described in the description. Only reason I gave 4 stars was due to the fact that they were very wrinkled and difficult to get out. Other than that, I would recommended these curtains. I love these curtains. The fabric is substantial & after a quick steam press, they hand beautifully. Look great. Thinner than I thought, but still doing a good job of holding back the Colorado cold in a daylight/garden basement window. "Is the backing the same color as the curtain, or is it white?" No, the backing is a white/off white, as it is a foam/thermal backing. "What color is black pearl exactly? I don't see a black curtain in the pictures. Is it the dark gray one?" Black Pearl is the dark grey/charcoal color. "Is each panel 54" wide or is 54" the width of the 2 panels together? Thank you!" Each panel is 54 inches wide. "How wide is each panel? Is the grey color available?" The item is exactly as pictured- it does not have much shine to it. They are not. They are very heavy, and you will need to break up the heaviness with sheers in the middle. I wasn't sure if I liked them until I put the sheers in and now they look great. "are the teal color more of a teal blue or teal green?" The color is teal. It may appear more teal green. "I know the package says are to be hand washed, but has anyone put them in the wash on delicate cycle? I got the off white and they are dingy. " You can add style and color to any room with the right window treatments. Curtains can help define the theme of a space and add a finishing touch to the overall decor. If you're unsure of where to start, this curtain buying guide has you covered. Find all the inspiration and information you need to get started right here. Leaving your windows naked and bare means you’re missing out on a big interior design opportunity. Beautiful window treatments provide privacy, filter sunlight, and add warmth while bringing style to your home. Before you can choose the perfect drapes for your space, it’s vital to get the correct window and curtain measurements. We’ve laid out exactly how to determine what size your curtains should be, so you can spend more time choosing the best curtains for your home. To learn more about curtains, read our Curtain Buying Guide. Choosing curtains isn't always easy. With so many options, how can you make sure that you find just the right style? Luckily for you, we've broken down the best curtain styles and fabrics for specific rooms in your home, no matter your decor preferences. From valances to panel curtains, we’ve got the best ideas for every room in your home. Keep reading to learn more! Hanging your curtains doesn't have to complicated. In fact, it's a breeze! There are just a few things you have to keep in mind when getting it done. We've broken it down into a few easy do's and don'ts to keep you on track. If you need a more comprehensive, step-by-step outline on hanging curtains, check out our guide on How to Hang a Valance and Curtains. When choosing window treatments for your home, one of the most important aspects to consider is the fabric. The type of fabric affects how curtains hang and drape, as well as the texture, coverage, durability, and ease of laundering. Check out the following curtain fabrics so you can decide which window treatments best match your decor and needs. If windows are the eyes of your house, think of curtains as eyeshadow. These types of window treatments can add just the right amount of color and interest to any room. If you're on the hunt for the right curtain styles to match your home design, look no further. This curtain style guide will help you find the perfect curtains for your home. Hanging a valance and curtains over your window will add dimension, texture and style to any room. Window curtains with a valance give your window treatments a finished, designer look.